The Rotermann Quarter, which will be 189 this year, is similar to the Old Town of Tallinn when it comes to the density of historic buildings. The Rotermann Quarter has become an urban space of unique architecture and vibrant rhythms. Over the years, the developer Rotermann City OÜ has partnered with the architecture firms Kosmos (Mihkel Tüür, Villem Tomiste, Ott Kadarik), KOKO Architects (Andrus Kõresaar, Raivo Kotov), ​​Alver Architects (Andres Alver, Indrek Rünkla), Teigar Sova Arhitektid (Vahur Sova), HG Arhitektuur (Hanno Grossschmidt, Tomomi Hayashi) and the Emil Urbel Architectural Bureau. The barley, wheat and rye mill, sampling mill, boiler plant, and power plant have been renovated. The carpenter’s workshop with its three techno-futuristic exterior towers was shortlisted for the European Union Architectural Award in 2009. The new flour storage was joined to the old flour storage using an atrium. The elevator building, which is considered the uncrowned symbol of the Estonian industrial landscape, was awarded in 2016 by the National Heritage Board recognising the best renovated building. The last historic building, a bread factory, is being renovated. Exclusive new buildings pay tribute to the quarter’s history: the Orange, Brown, White, Black, Golden and Red houses. 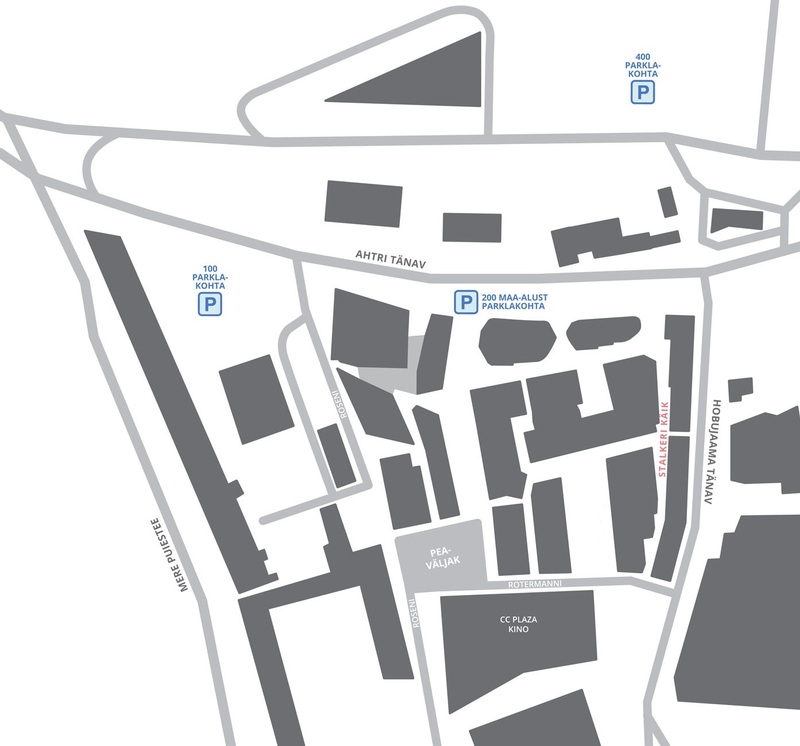 The streets have new names: Rotermann and Rosen streets and the Stalker passage. Rotermann square has become the heart of the quarter. Tallinn. His grandfather, also Christian Rotermann, was a goldsmith in Paide while father, Christian Abraham Rotermann (1801-1870), was an artisan hatter who came to Tallinn in 1828 and founded the merchant court “Chr. Rotermann”. The merchant court primarily dealt with the production, import and export of construction materials. In 1849 Christian Abraham Rotermann built a department store by the Viru Square. In time, a whole complex of factories merged with Rotermann’s merchant court and the so-called Rotermann Quarter was formed next to Mere Avenue. At the beginning of the 20th century, the Rotermann business expanded extensively. 1902 saw the erection of the high chimney that continues to stand as the ‘landmark’ of Rotermann Quarter. The grain elevator and flour mill were completed in 1904, the five-floor barley mill in 1905. The salt storage, completed in 1908, was made according to the project of Ernst Boustedt, a Baltic-German engineer, and is one of the most idiosyncratic Estonian limestone buildings preserved to this day. An Art Nouveau residential red-brick home was built at one end of Mere Avenue in 1910-11 as replacement for the wooden residence of the Rotermanns. The architectural solution of the building is ascribed to Eliel Saarinen, the famed Finnish architect. A new gatehouse was also completed in 1911. 1912 saw the opening of a bread factory, the most modern bread production facility in all of Russia. The time of wars and troubles that reigned during 1918-20 did not leave Rotermann Quarter untouched and several buildings that had lost their owners were dismantled. During the existence of the Republic of Estonia, the district lived through all the rises and falls along with the country itself. In 1921 the Rotermann Factories concern was taken over by C. B. Rotermann’s son, Christian Ernst August Rotermann, who, among other things, led the construction of one of the first car sales outlets in Estonia. The 1920s were extremely successful for the stock company Rotermann Factories. A big setback was the gigantic fire of 1930 that wiped out much of the company’s grain reserves. It took two weeks to put out the flames. However, the accident did not break the stock company. During the 1920s and 1930s, Rotermann Quarter housed not just the flour and bread factories but also the timber plant, roofing paperboard mill, lumber mill, wool factory, raw linen processing plant, porcelain and decorative glass workshop, weaving workshop, refrigeration house, and the Rosen & Co Tallinn Vodka Factory that was the first to offer an extremely rich selection of alcohol. Major projects were designed during the first republic for making Viru Square more upscale, but unfortunately these were cut short by World War II. The Soviet occupation brought major reorganization also to the Rotermann Quarter. All private companies were nationalized. The Rosen & Co rectified spirit factory was renamed as Tallinn Spirit Rectification Factory, Rotermann Factories was named Viktor Kingissepp Integrated Grain Works. During the German period in 1941-44, several companies were returned to their former owners and Rotermann Factories was also restored, but production capabilities were severely limited under the conditions of war. The bombing of Tallinn did not leave Rotermann Quarter and its environs untouched and among the buildings destroyed were the Art Museum, located at one end of Narva Highway, and the cinema Grand Marina, located next to Mere Avenue. The Soviet occupation returned in 1944 along with parasite buildings and an unexpected regression in urban space maintenance and care. One of the anchor companies of Rotermann Quarter during the occupation was the bread industry. The production facility Leibur used the Hobujaama building as a bread factory even until the latter part of the 1980s. At the beginning of the 1970s, Tallinn’s downtown area became the subject of an extensive reconstruction plan according to which the Viru Hotel and the port would have been connected by an extraordinarily wide pedestrian boulevard – the potential death of Rotermann Quarter. Fortunately, the detailed plan was dismissed in 1981 after opposition from architects. A new arrival to the district in 1980 was a square-shaped Tallinn Post Office Headquarters building. The Soviet-era atmosphere changes to Rotermann Quarter have been immortalized in world cultural history. The decaying industrial area became the set for the majority of scenes from Stalker, a film by Andrei Tarkovsky. The majestic old industrial buildings along with layers from a completely different world create the conflict that forms a poignant frame around Tarkovsky’s philosophically powerful film. The development of Estonia after the restoration of independence is nicely symbolized by the changes in downtown Tallinn. Rotermann Quarter was not spared by the winds of change. The Soviet era had wreaked havoc on the district’s buildings and the period of indetermination that followed led the buildings to dilapidate to such an extent that their repairs were considered unfeasible. During the reconstruction of one end of Ahtri Street, creation of a new direction of traffic cut through the district, separating it from the portside area along with the Rotermann salt storage. In 1996 the salt storage was reconstructed and now houses the Museum of Estonian Architecture. A multiplex cinema with 11 screens, Coca-Cola Plaza, was opened in the district in 2001. The same year Rotermann Quarter was declared a region with cultural and environmental value. According to the heritage conservation folks, the old industrial quarter was to be a friendly host to both former industrial buildings with a new function and to the high-quality contemporary architecture. The height limit of the new buildings was set at the peak height of the grain elevator (24 m). This restriction sat well with the conditions of the development companies and soon Rotermann Quarter witnessed lively construction activity.